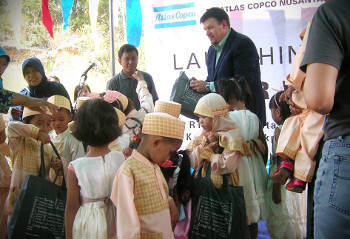 Atlas Copco Nusantara, in conjunction with the Water for All program, opened the first water well and mini water treatment facility in East Kalimantan on Thursday, November 28. The inaugural ceremony was held in the Daksa Village where the water well is located. Village residents in Daksa and Sepingan, near Balikpapan, will benefit from the long-awaited clean water supply. The Water for All program is a part of the corporate social responsibility initiative of the Atlas Copco Group. Jess Kindler, director for PT Atlas Copco Nusantara, distributes school supplies to the local children during the Water for All event. Jess Kindler, director for PT Atlas Copco Nusantara, attended the ribbon cutting ceremony and signed the inscription of the Water for All program. Also in attendance was the chairman of NGO Sepinggan Hadi Susanto, Ward Sepinggan Nyoto Harsono, member of Commission IV (Legislative) DPRD Balikpapan Thohari. Kindler also provided a certificate of donation to national Atlas Copco employees who donated to the construction costs of the Water for All project throughout the year. Due to the Atlas Copco Group doubling the employee’s donations, Atlas Copco Nusantara was able to donate $20,000 and help an estimated 500 people in that area gain access to clean water. 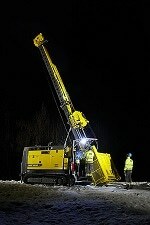 PT Atlas Copco Nusantara Headquartered in Jakarta, the new 350-member PT Atlas Copco Nusantara company offers capital equipment field support and auxiliary product installation through its Jakarta office and 9 regional hub locations. 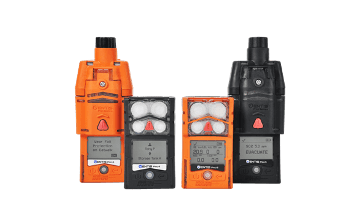 Close customer support is provided from remote and in-mine personnel in approximately 11 additional locations.